There are many references to short legged hounds throughout Europe as early as the 1500s. It is believed that these hounds were descendants of hounds developed by St. Hubert. In Turbeville's Art of Venerie (Art of Hunt) in 1576 “St. Huberts are described as being mighty of body, legs low and short, not swift, but good on scent." Over the pursuing years the St. Hubert Hound evolved in several regions in France. They were used for different quarry based on the region they were in. 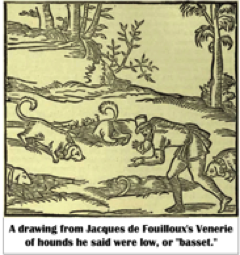 In 1585 the first mention of "basset" or "low" appears in Jacques de Fouilloux's La Venerie (The Hunt) describing a hound used to hunt badger. He specifically notes a crooked legged smooth coat hound that works best in undergrowth. Any hound lower than 16 inches was called a basset. There were as many as twelve variations of these short hounds in France. They were also found in other parts of Europe. As forms of hunting changed to include shooting, these hounds spread in popularity through France, where hunting and hound breeding was taken seriously by the ruling classes. It’s important to note that rabbits were considered vermin because they destroyed crops. In France alone there were at least a dozen “basset” breeds and even more in other countries. Unfortunately the French Revolution (1789 - 1799) put an abrupt end to the ruling classes in France and also their kennels. Many strains of dogs became extinct including the St. Hubert Hound. It wasn’t until the 1860s when improvements in financial security and transportation had been established in France due to the Industrial Revolution and political changes that a new aristocracy could form. The first French dog show was held in Paris in 1863. Several breeds of low, basset sized, French hounds were exhibited at that show. • "Basset Bleu de Gascogne"
• "Basset Fauve de Bretagne"
There were also other similar hounds in other countries, either in height or other similar features. This section of our website is intended to introduce people to them and perhaps clear up any confusion between the different breeds. And a series of Swiss Hounds that most kennel clubs and canine organizations treat all members as varieties of a single breed. Some could easily argue that dachshunds should be added to this list as they are a short hound. Perhaps, at a later date, they'll be added. For now I'll just link to the page of their AKC Parent Club, The Dachshund Club of America. As time allows for future research more breeds may be added to this list. It takes a lot of time to research and put together pages like this. The intent of this page and connected pages is to introduce those who follow the Basset Hound an opportunity to know about similar breeds as well as clear up some confusion some may have in determining breed characteristics. It is our hope that our members and guests will become more educated about the other "basset" breeds. We recommend that those of you with more interest in any of these breeds do more research on your own. What is included here is very minimal. We don't have an abundance of space. Some of the breeds have "parent club" either in the United States or other countries that would be excellent places to start. This page and the attached pages are meant solely for educational purposes. It is hoped that they will help tho visit our website to understand the various hound breeds that are similar to one another. Education is an important part of our club's purpose.